BizTech explores technology and business issues that IT leaders and business managers face when they’re evaluating and implementing a solution. BizTech is published by CDW, which is headquartered in Vernon Hills, Ill.
About: Ricky has been a working journalist for more than 10 years with a strong background and emphasis in digital content and interactive storytelling. For more than 8 years, Ricky has helped shape the evolving integrated content strategy for BizTech, shepherding the program through different redesigns and the emergence of several new content types. When not immersed in all things business and IT, Ricky indulges his deep love of comic books, super heroes and video games. 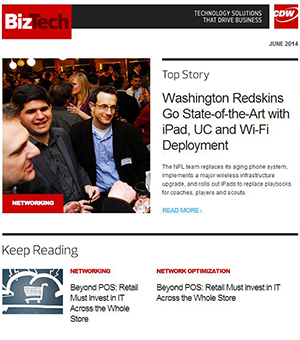 About: Bob Keaveney is the managing editor of BizTech magazine. A believer in the power of storytelling to inform professional audiences, Bob has worked in content roles for more than 20 years, as a newspaper reporter, magazine editor and content marketer. When he’s not editing content, Bob loves sports, traveling and cooking. About: Brad is a senior editor for BizTech magazine and works closely with media relations and other professionals to develop articles for the magazine. Brad was most recently a public relations specialist at S&S Public Relations. Before that, he handled public affairs for the U.S. Department of Energy. When not following the Cubs and Hawkeyes religiously, Brad is an avid distance runner and has been competing in races across the Midwest for more than 15 years. About: Juliet is the senior web editor for BizTech magazine. In her nine years as a journalist she has covered everything from aerospace to indie music reviews — but she is unfailingly partial to covering technology. Cloud, On-Prem or Hybrid: How to Choose?